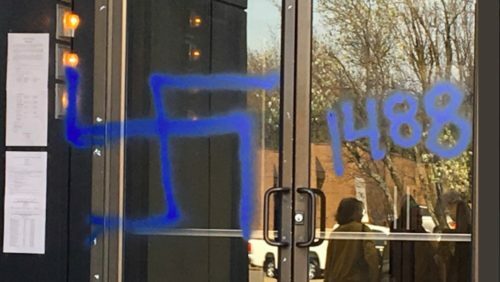 Oklahoma City police are seeking a female person of interest in the spray-painting of Nazi symbols, racial and transphobic slurs on office buildings used by the Oklahoma Democratic Party and the Native American Chickasaw Nation two miles away. “HH” is white supremacist code that stands for “Heil Hitler,” and “1488” stands both for the 14-words slogan — “We must secure the existence of our people and a future for white children” — and “Heil Hitler” (H being the 8th letter of the alphabet). Oklahoma City Police have released images of a woman wanted in questioning for the vandalism. Police have encouraged community members to call with any information they might have.